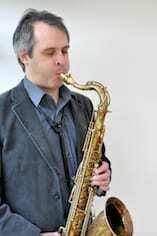 Josh is an acclaimed saxophonist and composer based in London known for his melodic inventiveness, warm tone and heartfelt and lyrical approach to improvisation. His latest CD ‘Tone Poetry’ is due for release in 2014, with a 30 date UK tour featuring Tim Lapthorn on piano, Mick Hutton on bass and Matt Skelton on drums. He has worked with many musicians and vocalists including John Turville, Alan Barnes, Eileen Hunter, Liz Fletcher, and Steve Waterman. Previous CDs include Animus, released on 33 records, and Kukus and Animation Suspended in collaboration with pianist Tim Lapthorn. After gaining a first in Philosophy at Oxford University, Josh won scholarships to study at the Guildhall and Trinity College of Music; and his quartet ‘Bop Art’ were the Daily Telegraph Young Jazz Band of the Year. Josh is a founder member of the e17 jazz collective, based in Walthamstow. He is an artist endorser for JodyJazz mouthpieces and SAXXAS ligatures and runs Fulltone Recording, specializing in capturing acoustic music. Josh is also an active jazz educator: he conducts workshops and courses around the UK.